Today I have with me as part of the Promised blog tour Caragh M. O'Brien author of the Birthmarked trilogy. I asked her to write a guest post on how she created such different societies in the first two books in the series, Birthmarked and Prized, and she had a great answer! Let me say thanks, Mariah, for inviting me by A Reader’s Adventure and pitching me such a thought-provoking topic. How I created such different societies in the Birthmarked trilogy was rather an involved process. At first, I just invented what I needed as I needed it, and then I revised like a banshee. To explain a bit more, I need to talk about the key characters in Birthmarked and Prized, so in fairness, I should warn your readers that a few general spoilers follow. Stop here if you haven’t read the books and don’t want to know anything more, but feel free to continue if you already know basically what happens. I was first interested in how the people on different sides of the wall in Birthmarked would create their own separate but interdependent societies. It seemed natural to explore what happens when some people have advanced technology, resources, education, and security while others near by have none of that. I immediately had a lot of sympathy for Gaia because she was raised outside the wall, with no advantages besides her loving parents. She seemed so vulnerable, especially when she was first interrogated by Sgt. Grey. Him I instinctively mistrusted. He had so much legal and authoritative power backing him, with all this potential to abuse it. He frightened me probably all the more because he was so polite. The societies really boil down to the individuals, which is why the tension between societies is reflected best in the relationship between Gaia and Leon. She’s a midwife, educated by her mother. She’s smart, physically scarred, impulsive, morally strong, intense, and honest. Leon’s a guard from a wealthy, twisted family. He’s educated, civil, repressed, physically strong, morally absent, and scarred inside. As they deal with their worlds, they’re essentially learning from each other, and I love how Gaia’s understanding of both sides of the wall changes through the novel. Neither side is perfect, and both are horrible in different ways. It makes me think about which horrible ways matter most, you know? Would I rather be poor from a loving family, or rich and isolated? Would I rather have an education and decent medical care, or freedom from strict laws and surveillance? 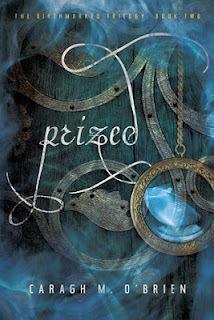 By the time I began thinking about the second book, Prized, I wanted to see what Gaia would be like if she obtained a position of power, and I was also interested in societies that are constrained by environment. Of course, all societies are constrained by their environments, but in my fictional extreme, the people of Sylum actually can’t leave. They die if they do. I liked the inherent possibilities in an imbalance of the population, with men outnumbering women 9 to 1, and then I put the women in charge to see how that would work. It was really fun and started me thinking about all the unconscious ways I expect men and women now to be equal and not equal. What if men couldn’t initiate a flirtation? What if they couldn’t vote? I did much revising to get the rules of Sylum society right, from the way no men could touch Gaia to how they’d be punished if they did. Once again, what mattered to me was how the rules and taboos affected individual characters, and soon I had a beautiful reversal to work with. Because she was a girl, Gaia was automatically valuable when she arrived in Sylum. Leon was automatically worthless, and mad about it. Their positions completely influenced how they dealt with each other and created enormous barriers of resentment and confusion. They ended up in some terrific fights. Fun. Oh, my gosh, was Prized fun to write. It’s clear to me, now that the books are complete, that of course the inhabitants are creatures of their societies, but when I was first exploring ideas, I was just looking for character and the conflicts that would push character further. The nuances of the societies showed up in the revising. I like playing with good people who mean well and still manage to mess everything up. I like the gray zones within people, and between them, and I like a bit of hope that we can all try to work things out. Thanks again, Mariah, for having me by on this blog tour. I hope you’ll enjoy seeing what happens to Gaia when the societies of Birthmarked and Prized collide in Promised. Thanks so much for stopping by Caragh! If you haven't read the Birthmarked trilogy I recommend that you go pick it up so you can experience there varied societies! 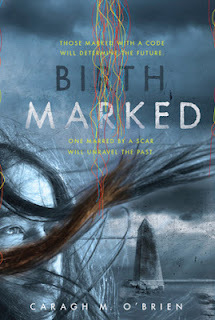 Also be sure to check out my review of Birthmarked as well as my review of Promised where you can enter to win a set of the Birthmarked trilogy! Thanks for the fabulous guest post. I love how she took her characters into deep consideration. How the rules and taboos would affect them. It's great when the characters are well rounded. GREAT, great post! Love hearing stuff like this from author. I can't wait to see how it all go downs. I'm really intrigued by this series. I like that the main character is so unique but so is the different societies. It sounds like different things are at odds and trying to live in such a world is bound to be interesting. I can't really read this because I'm a book behind in the series. 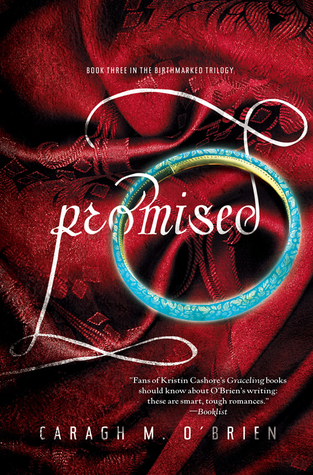 I loved the first book though, and I'm going to start Promised next because I'm going to see Caragh on the Fierce Reads tour. Thanks for the great guest post! I love hearing the things authors do when writing. I can't wait to see how it ends! !